This appeared as a PNNL news release February 18. Harvested from the poop of goats, horses, and sheep, anaerobic gut fungi pictured here help herbivores digest stubborn plant material. A team of researchers report in Science that these fungi could potentially lead to cheaper biofuel and bio-based products. Image courtesy of University of California, of Santa Barbara. Enlarge Image. Results: Nature's figured it out already, how to best break down food into fuel. Now scientists have caught up, showing that fungi found in the guts of goats, horses and sheep could help fill up your gas tank too. "Nature has engineered these fungi to have what seems to be the world's largest repertoire of enzymes that break down biomass," said Dr. Michelle O'Malley, lead author and professor of chemical engineering at the University of California, Santa Barbara. Why It Matters: These enzymes-tools made of protein-work together to break down stubborn plant material. The researchers found that the fungi adapt their enzymes to wood, grass, agricultural waste, or whatever scientists feed it. The findings suggest that industry could modify the gut fungi so that they produce improved enzymes that will outperform the best available ones, potentially leading to cheaper biofuels and bio-based products. To make the finding, O'Malley drew upon two U.S. Department of Energy (DOE) Office of Science User Facilities: the Environmental Molecular Science Laboratory (EMSL) at Pacific Northwest National Laboratory (PNNL) and the DOE Joint Genome Institute (JGI). O'Malley's study is the first to result from a partnership between the two facilities called Facilities Integrating Collaborations for User Science or FICUS. The partnership allows scientists around the world to draw on capabilities at both Office of Science user facilities to get a more complete understanding of fundamental scientific questions. O'Malley's team also included scientists from PNNL, DOE JGI, the Broad Institute of MIT and Harvard, and Harper Adams University. "By tapping the RNA sequencing and protein characterization capabilities at the respective facilities, we have advanced biofuel research in ways not otherwise possible," said Dr. Susannah Tringe, DOE JGI deputy for User Programs. "This collaborative program was established to encourage and enable researchers to more easily integrate the expertise and capabilities of multiple user facilities into their research. FICUS offers a one-stop shopping approach for access to technology infrastructure that is rapidly becoming a model for collaboration." The Poop Scoop. 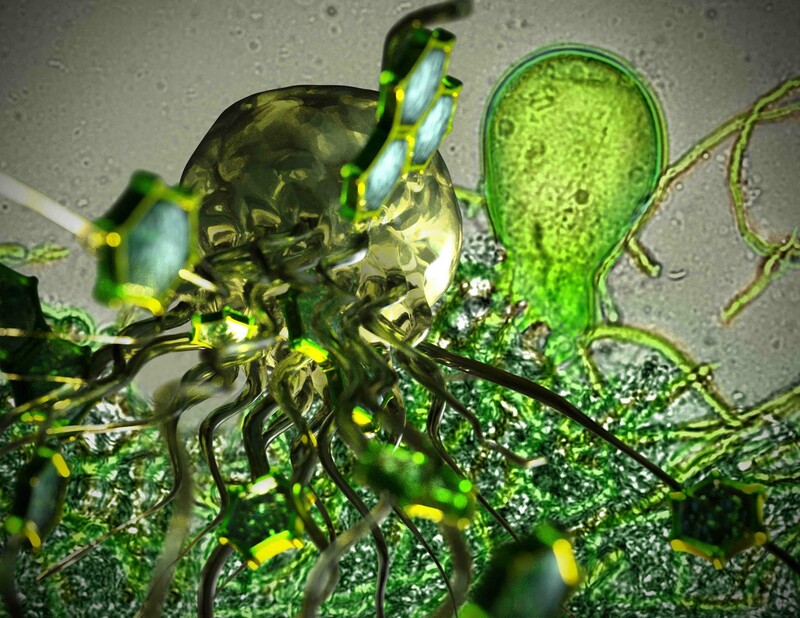 Companies want to turn biomass like wood, algae and grasses into fuel or chemicals. The problem: The matrix of complex molecules found in plant cell walls-lignin, cellulose and hemicellulose-combine to create the biological equivalent of reinforced concrete. When industry can't break down this biomass, they pretreat it with heat or chemicals. Or throw it away. Both options add to the cost of the finished product. As some of the world's first nucleus-containing single-celled organisms, anaerobic gut fungi have been around since before the dinosaurs. Scientists have long known they play a significant role in helping herbivores digest plants. One reason has to do with the swarming behavior of some fungi. When the fungi reproduce, they release dozens of spores with tail-like appendages called flagella. These baby fungi swim around like tadpoles and find new food in the gut. They then trade tails for root-like structures called hyphae, which dig into plant material. Then foliage becomes food. O'Malley and her colleagues knew the fungi's hyphae excrete proteins, called enzymes, that break down plant material. Like tools in a toolbox, the more diverse the enzymes, the better the fungi can take apart plants and turn them into food. If industry can harness fungi with such a toolbox, it can more effectively break down raw biomass. "Despite their fascinating biology, anaerobic gut fungi can be difficult to isolate and study," said Dr. Scott Baker, EMSL's science theme lead for Biosystem Dynamics and Design. "By utilizing the cutting-edge scientific capabilities at EMSL and JGI, O'Malley showed how the huge catalog of anaerobic gut fungi enzymes could advance biofuel production." Fungi That Are the Cream of the Crop. In the hands of scientists, a list of enzymes produced by gut fungi is the first step to unlocking their biofuel-producing potential. Like monks in a monastery copying religious texts, messenger RNA molecules transcribe the genetic information needed to make proteins, including enzymes. So the DOE JGI sequenced the mRNA of several gut fungi to come up with their transcriptome, which represents all the possible proteins they could make. O'Malley compared this effort to re-assembling a map from its pieces, only without seeing the complete picture. Since not all proteins are enzymes, the researchers needed to cross check their map with another one. Enter the EMSL, where researchers created that second map that identified enzymes the fungi actually produced. This so-called proteome acted like landmarks that matched up to JGI's map, highlighting the biomass-degrading enzymes in the transcriptome. Together, the maps from JGI and EMSL pointed to the treasure trove of enzymes gut fungi can produce. Compared to the industrial varieties, which top out around 100 enzymes, gut fungi can produce hundreds more. Of note, the fungi produce enzymes better at breaking down a hemicellulose found in wood, called xylan. And when the scientists changed the fungi's diet from canary grass to sugar, the fungi responded by changing the enzymes it produced. In other words, the fungi can update their enzyme arsenal on the fly. "Because gut fungi have more tools to convert biomass to fuel, they could work faster and on a larger variety of plant material. That would open up many opportunities for the biofuel industry," said O'Malley. Additionally, O'Malley was the recipient of a DOE Office of Science Early Career Award within the DOE's Office of Biological and Environmental Research (BER) Program. O'Malley will present her findings at the DOE JGI's 11th Annual Genomics of Energy & Environment Meeting in Walnut Creek, California, on March 24. Registration is still open for the meeting. This work was supported by the U.S. Department of Energy, Office of Science, Office of Biological and Environmental Research (BER); the U.S. Department of Agriculture; and the Institute for Collaborative Biotechnologies. A portion of this research used resources at the DOE Joint Genome Institute and the Environmental Molecular Sciences Laboratory. Research Team: Kevin V. Solomon, Michelle A. O'Malley, Charles H. Haitjema, John K. Henske, and Sean P. Gilmore, UC-Santa Barbara; Dawn A. Thompson, Diego Borges-Rivera, and Aviv Regev, Broad Institute; Anna Lipzen and Igor V. Grigoriev, DOE Joint Genome Institute; Heather M. Brewer, Samuel O. Purvine, and Aaron T. Wright, PNNL; Michael K. Theodorou, Harper Adams University. In One Sentence: PNNL scientists are on a team that discovered fungi found in guts of goats, horses, and sheep perform as well as fungi engineered by industry in their ability to convert plant material into sugars easily transformed into fuel and other products. In 123 Characters: A research team reports in Science that fungi found in goat, horse, and sheep gusts could also help fill up your gas tank.